A follow-up to my last map, here is a look at the larger world of the map. 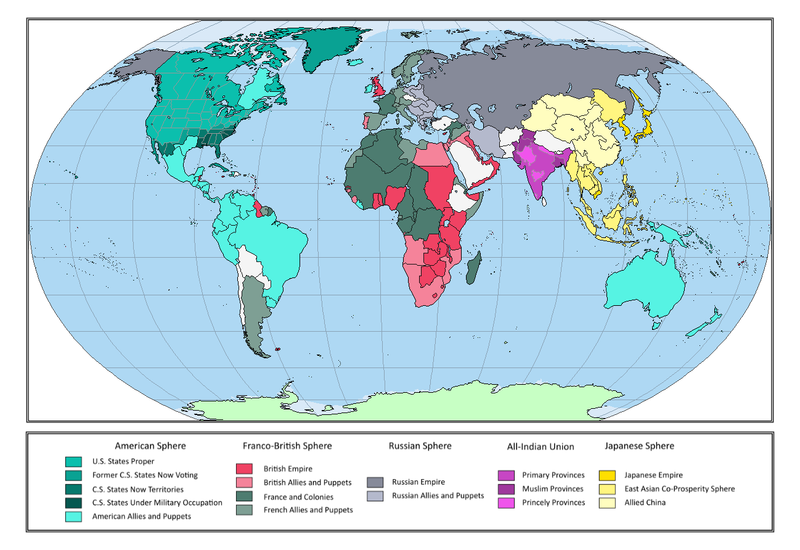 As noted in the last map, this world is based on Harry Turtledove's Southern Victory series, but differs in that the religiously fanatical Gordon McSweeney becomes President of the United States in the 1930s. Switching sides from their long-term German allies, the Americans fight on the side of the Entente in the Second Great War and brutally beat down the divided and weak Confederate States of America. In Europe, the Entente meets similar success and partitions the former German and Austro-Hungarian Empires between them. By the year 1954, the world has largely begun to calm from the effects of the Second Great War and the chaos that followed its conclusion. In the Americas, the United States stands supreme as a giant stretching from the Arctic Ocean to the Sea of Cortez. Gordon McSweeney's Christian Democrat party rules the United States as a single-party dictatorship under McSweeney's firebrand Protestant Christian values and a pan-American fascism heavily favoring state-controlled economies and brutally rolling up any separate cultures into that of the northern "Yankee" Americans. Interestingly McSweeney's government found somewhat unlikely allies in evangelical black citizens of the former Confederacy, whose Protestantism and hatred for the southerners who brutally oppressed them and kept them in slavery as long as possible has won them great support among the party leadership. Major American allies include the laissez-faire Texas, Franco-American blackshirted Quebec, and the growing power of the United States of Brazil. Only Argentina, humiliated one too many times by its neighbors, refuses to join or support America's system of allies. It is unknown yet if it will pay a price for that decision. In Europe, the continent is split between the two major continental powers: France and Russia. The French government under Action Française was massively successful in the Second Great War, and since then its pro-European brand of secular, cultural fascism has spread to its new puppets in central and western Europe. In order to keep itself competitive against the Russians and Americans, the French have instituted a European common market in the hopes of linking their sphere in Europe together economically, politically, and culturally in order to oppose the Russian Empire and its allies. This is particularly important in a time when many of France's overseas colonies and its occupied areas in the former Ottoman Empire--Syria and Kurdistan--grow evermore restless. Since losing Australasia and New Zealand to America's sphere due to the former's doubt that the British Empire could adequately protect them from the Japanese, the British Empire and its allies have largely cast their lot with the French as the world moves toward rigidly choosing sides. With Canada, Australasia, New Zealand, and India gone, the United Kingdom has begun to focus most of its attention towards its African colonies in hopes of getting some good out of them or risk becoming a third-rate power behind the French, Americans, and Russians. It would comes as a surprise to just about anyone at the turn of the century that the Russian Empire would be one of the most democratic of the major powers, but it is true (technically the UK still has elections just dominated by hard right conservatives, but they have shut down almost all representation outside the Home Islands). Russia, though still a monarchy, not only has a Duma with actual power but real elections as well, which are currently dominated by a coalition of centrist and mild leftist parties while the main conservative party is the primary opposition. Russia's puppets in Europe are even allowed to be more allies, with different types of government and are even asked for their agreement to decisions rather than having them openly opposed. This does not mean, however, that the Russians are nice. Their hold on Tsargrad, formerly Istanbul, is iron-fisted and any "equal ally" attempting to leave Russia's sphere would find itself on the receiving end of Russia's powerful barrel forces very quickly. Still, Russia's sphere remains relatively decent and beginning to economically prosper under the more pro-capitalist measures of the current Russian government. Without as devastating a Second Great War as our own world's Great Patriotic War, Russia is second only to the United States in terms of economic power and one day may even pass it. The final major sphere of influence belongs to what is perhaps the true winner of both Great Wars: Japan. Making out like a bandit both times, Japan has grown from a regional power to a superpower in and of itself, with a sphere that includes a huge segment of the global population. With its personal empire growing to include Korea, Taiwan, Hainan, Cochinchina, Macau, and Hong Kong, Japan's government also created the East Asian Co-Prosperity Sphere as an alliance system of former European colonies (and, later, Manchuria) that would be economically and politically linked to the Japanese Empire. On the scale of control of puppets, Japan's government keeps theirs in a tight grip. The Japanese imperial code, at least, has begun to be relaxed in favor of a still-strict sense of cultural unity and ethics among Japan's allies in an attempt, like France, to unite allies together to form a larger superpower to compete with the, figurative and literal, giants that are the United States and Russia. Japan also keeps China under its sway under the auspices of "Allied China" that are supposed to be various Chinese states allied together and to Japan for their own betterment. In reality, Japan plays each state off each other in hopes of keeping China disunited as long as it can, either until Japan can exceed China in power or until the Chinese states begin to be a part of the Prosperity Sphere. The world, as it is, stands on edge. The great powers of the last war now look at each other with mutual suspicion and even hate as ideological disagreements fare brightly between them all. At the center of the world's precarious nature is the All-Indian Union. Conceived in the waning days of the British Raj, the Union is a mind-numbingly complex system of states and provinces that, as best as any government could, appease all religious groups as well as the powerful princes of the former Raj. Each group tends to have its own very harsh and loud voice in the government and the many peoples of India are united only by their animosity towards everyone else who would seek to control them. It's a risky system, but one that has drawn great dividends for the Indians; they are currently the fastest-growing economy in the world. As a consequence, virtually every alliance system is seeking to court the union into their own sphere. Only time will tell what side, if any, will succeed, but whatever happens will threaten to destroy the delicate balance the world currently finds itself in.